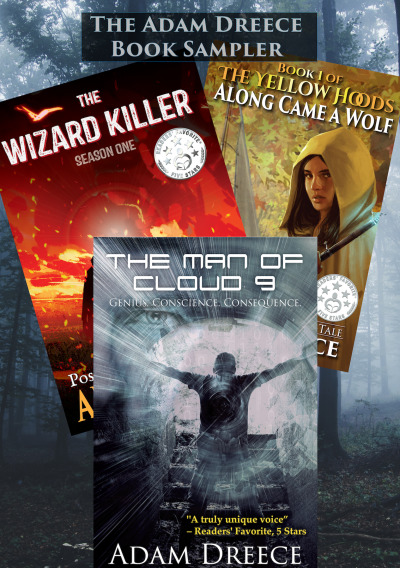 Adam Dreece is known for three great worlds, enjoy up to 40% of each of them! This middle grade/YA, Steampunk meets Fairy Tale series will have you laughing and biting your nails. Discover brilliant inventors, snarky humor, and fairy tales made real in this Amazon #1 best seller in Steampunk & Fairy Tale. Called "Mad Max meets Lord of the Rings" and "Harry Potter meets Die Hard," this is Adam's adrenaline, all action, side. Set in its own post-apocalyptic fantasy world, it walks the border of fantasy and sci-fi, with high intensity. A gripping, techno-thriller about a genius addicted to his tech-vision, and the idea that no good deed goes unpunished. Join the Newsletter! Lots of great stuff!